A month ago I revisited the Sixities in London attending The New Human Be-In. Last week I was in Paris as a guest of the California Department of Food & Agriculture and there was another Sixties tie in. 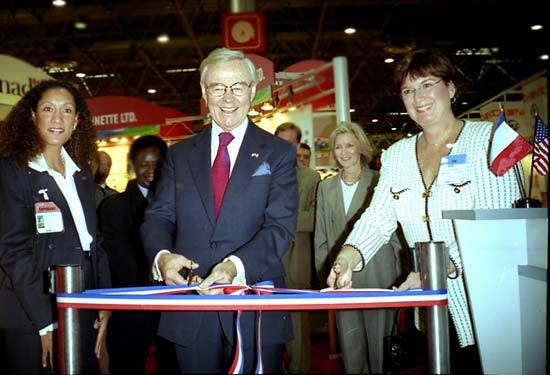 The SIAL Food show is the largest food show in the world and California was not to be outdone. The Sixties Counterculture is finally receiving the respect from the establishment it so righteously deserves.I was elated that "The Summer of Love" was the chosen theme this year and that all tied into California Cuisine. I quote the California Department of Food & Agriculture- "The Summer of Love spawned a revolution that still reverberates today- thirty five years later California still leads the revolution with cuisine that stimulates the taste buds. With changing times came a heightened awareness of the importance of eating foods that are wholesome, fresh and natural. Today, California is known as the place with a wide range of fresh and healthy foods, which is comforting to the flower child in us all." I second that emotion. What a long strange trip indeed. I'd like to thank and acknowledge some of the team which created the fabulous California Pavilion and all its accouterments. Fred Klose dreamed it all up; young Will Wollbold made so much of it happen with panache; Director Esther Vicente beautifully managed all the elements. Most of all I'd like to thank California Pavilion Coordinator Christian Vaughan for his expertise in designing so many of the particulars. We worked seamlessly creating posters of my work and wonderful print media touting the grande cuisine of California. What a pleasure sir. 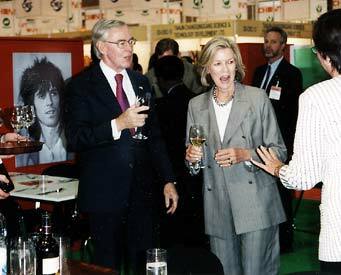 That's my photo of keith Richards next to the Ambassador and his wife.